Hiroji Yamashiro singing his iconic protest songいまこそたちあがろう (Time to Stand Up and Fight) during a New Year's morning celebration on the beach at Henoko in Okinawa. 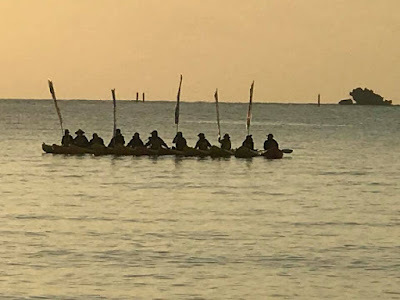 It is there that the people are resisting at the Camp Schwab gate and on kayaks in the water US efforts to build twin-runways on top of the bay for Marine aircraft that will destroy coral reefs and Dugong (relatives of the Manatee). 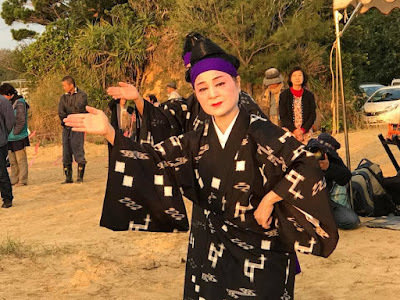 During the Obama administration his Ambassador to Japan, Caroline Kennedy, repeatedly refused to meet with the Okinawan people as they pled with the US not to go forward with this disastrous project that will destroy the environment and further make the island a prime target in a war. It was Hiroji Yamashiro that was jailed last year for five months in solitary confinement by the Japanese government (likely at the request of the US) for having committed the crime of helping to daily assemble the people at the gates of US Marine base Camp Schwab that sits on Oura Bay in Honoko. He is still on trial, and if found guilty of his non-violent crime of citizen participation in a so-called democratic society, he will likely face even more jail time. The people have been protesting against this new US base construction every day on sea and land for at least the past 16 years. Imagine that kind of determination and love for one another and our Mother Earth. While recently in Okinawa on the VFP delegation Hiroji joined one of our protests at the front gate of Kadena AFB where my step-father was stationed in 1953 during the Korean War. I brought along some photos he had been taken in during his time there as he posed next to 500 pound bombs and on the back of the photo he had written - "These are dropped on North Korea all day, every day." Following the protest that day at Kadena AFB Hiroji taped a message that will be played at the January 12-14 Conference on US Foreign Military Bases at the University of Baltimore in Maryland. The people of Okinawa, like the people of Korea, know war very well and don't want anymore of it. It appears that congressional leaders and the Trump administration in Washington are now pushing war with North Korea that if started would soon likely draw in Russia and China. If that happens the Korean peninsula would be engulfed in flames as would Okinawa. Let's move into the new year determined to each do what we can to prevent such an insane war from happening. Help by writing a letter, making a call, speaking to others, resisting the massive Pentagon budget, sharing photos of protests from Korea and Okinawa and joining protests here in the US. We've all got to contribute something to bring peace in 2018. A good conversation starter and fact, which often helps those unaware to realize their connections, is: "Everything generates itself". It is literally true. Get agreement with the premise; then plug in anything at all, eg., Peace/war, etc.